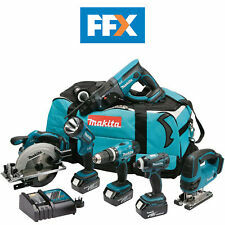 Makita DK18015X1 Combo Kit-Multicolour, 18 V (Set of 2 Piece) . 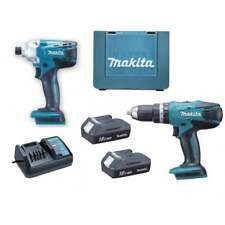 BUY FROM A GENUINE MAKITA SERVICE CENTRE. Carry Case. Isle of Man AB10-43, AB44-56, IV30-32. Scottish mainland HS1-HS9, IV40-IV51, IV55-56, KA27-KA28, KW15-KW17, PA20, PA34, PA41-PA48, PA60-PA78, PH42-PH44, ZE1- ZE3. Makita HR140D Makita HR140D. Compact and lightweight design. One touch sliding chuck for easy bit installation and removal. Noise sound pressure: 84 dB(A). Noise sound power: 95 dB(A). 65 x Assorted Accessories. 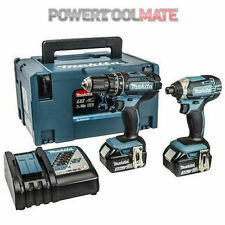 Makita CLX201AJ 2 Piece Cordless Kit 10.8V CXT Li-ion (2 x Batteries)IN CASE/USED. Condition is Used but it is in excellent working condition and excellent condition,some signs of use , please see photos for details of the items condition and if you have any questions please message me via eBay and I will do my best to answer your questions. Thank you for looking.Dispatched with Royal Mail 2nd Class Signed for. 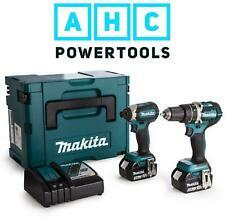 Makita 18V Power Tool Kit - DLX2131J. Condition is Used. Dispatched with Royal Mail 2nd Class. My father's used once Makita toolkit. I already have a unit so not needed. They were made in late 2018. All in great condition. Drill Bits & Sets. Saw Blades. Torque Settings 18 Drill. Forward and reverse trigger. Work Wear & Safety E. Coarse thread (length) 22 - 90 mm. No Load Speed 0 - 2600 rpm. No Load Speed (Hi) 0 - 1,700 rpm. Whether you're hoping to get to grips with a DIY project or need some new power tools for work, you'll find hundreds of Makita power tools to choose from. 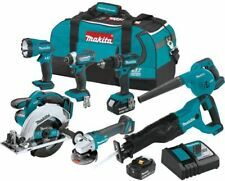 Makita power tool combo kits and packs enable you to buy a few of the most popular tools together and are a great way to equip yourself with everything you need to get the job done. Makita power tool combo kits and packs can include anywhere between 2 and 18 tools, so it's possible to get a range of useful power tools in one go to really hit the ground running with your DIY projects. Power tool combinations vary but will typically include commonly used tools such as impact drivers, impact wrenches, hammer drills and angle grinders, to make sure you have all the DIY essentials. A popular pairing is a combi drill and a driver, which is used to fit screws. Whether you're a professional or a hobbyist this useful combination can save you a lot of time that would otherwise be spent switching between drill and screwdriver bits. One of the biggest decisions you'll need to make when selecting your power tool combo kit and pack is whether you'd prefer cordless battery-powered tools or corded electric tools. Both have their benefits, and with battery life lasting longer than ever before you may want to opt for a combination of the two types in the pack you choose. That way you can enjoy the freedom that comes with not needing to be close to a power source with cordless tools, but also the power that comes with corded tools. Depending on the tools you go for and their power source, voltages range from 9.6 volts to 19.2 volts.